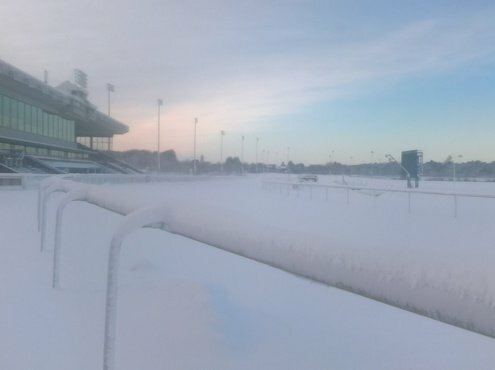 Eight inches of snow was dumped on Wolverhampton Racecourse's 'all weather' track in mid December, seemingly making nonsense of that claim. Yet, just twenty-four hours later, the course was made ready for racing thanks to the efforts of the grounds team, led by Clerk of the Course Fergus Cameron. Jane Carley went to the West Midlands venue to discover how they managed such a quick recovery. 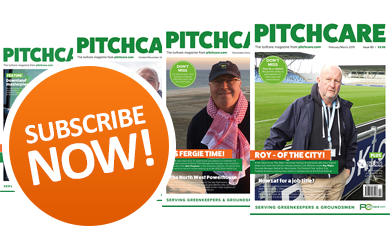 Ask a groundsman at an all-weather racecourse what his biggest challenge is and you might be surprised to hear it is the weather! Wolverhampton's Dunstall Park racecourse is one of the industry's busiest tracks, hosting seventy-nine meetings in 2018, although it has clocked up more than a hundred in some years. Racing takes place up to three times a week in January and February, coming after a busy Christmas period which sees 6,000 racegoers attend on Boxing Day, with 1,000 enjoying the venue's restaurants. 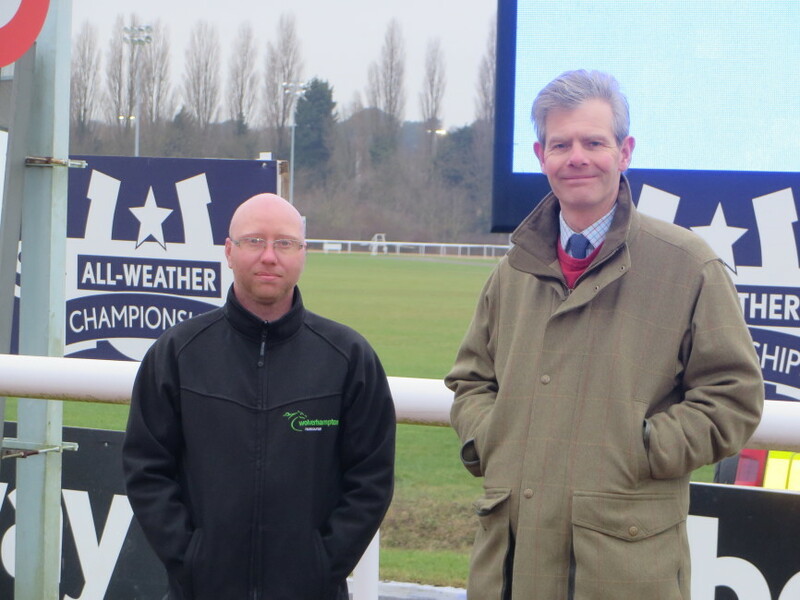 Faced by the worst cold snap the Midlands has seen for some years in December 2017, Clerk of the Course Fergus Cameron and his team had to admit defeat when eight inches of snow fell, and postponed a meeting - by twenty-four hours. 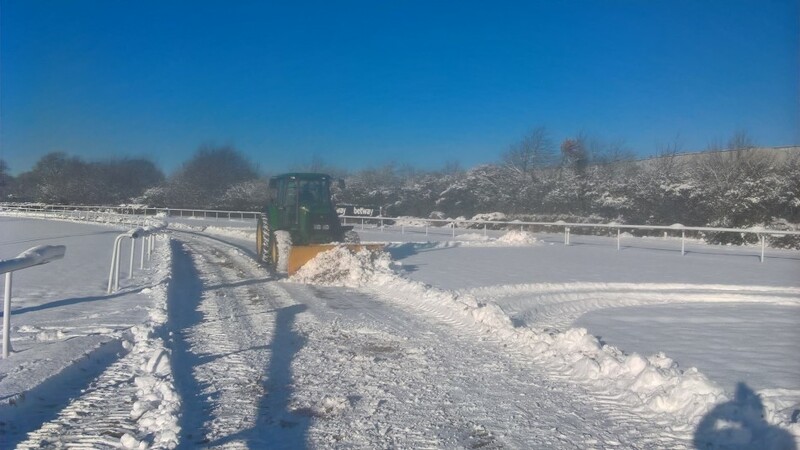 "We were able to clear the racing surface and it was raceable, but it was impossible to get areas such as the access to the stable yard and the car parks up to standard in the time available. As it was, we used the equivalent of eleven days labour to try and get it ready and, twenty-four hours later we were able to run," he explains. 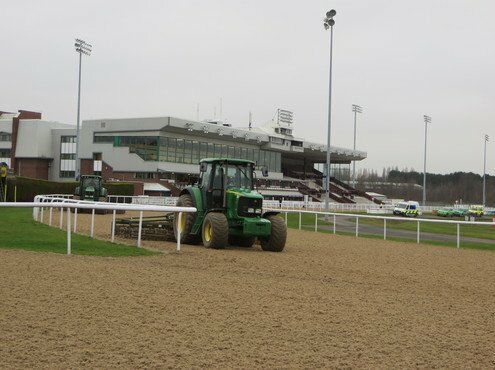 Wolverhampton became the first racecourse in Europe to use the Tapeta surface in 2014. 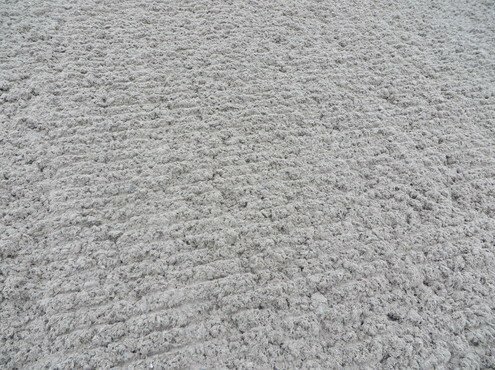 Tapeta is a patented wax coated mixture of sand, rubber and fibre developed by former leading British national hunt trainer Michael Dickinson and used all over the world. "The previous Polytrack surface, which had been down since 2004, included recycled products which break down over time and alter the way the surface performs." 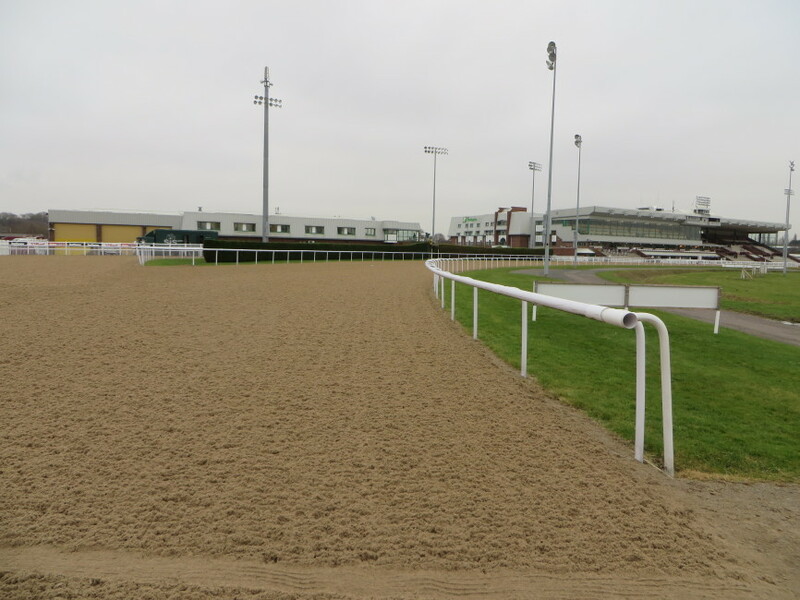 After being reconfigured when Polytrack replaced the original Fibresand surface in 1995, Wolverhampton remains largely unchanged, with its one mile round, 16m wide surface. 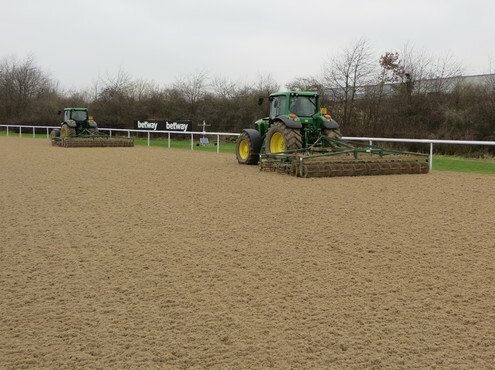 Some 29,000cu.m of Polytrack was removed and sold on before contractors Stobart installed the new surface, which is 18cm deep and is laid over 15cm of stone drainage layer and 5cm of porous tarmac. 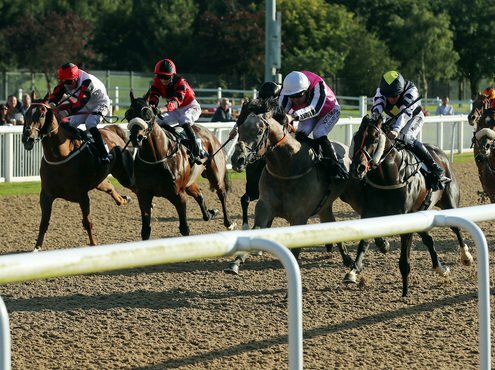 Tapeta has since proved successful on Newcastle's new all-weather track and is under consideration for Southwell, which is looking to replace its Fibresand surface next year. "All surfaces are different and require specific preparation, despite their similar construction," comments Fergus. "The wax binder, in particular, affects how the horse's hoof interacts with the track, which is why some tracks suit particular horses and not others." "We have to be careful not to get the track too quick; whilst we aim for an improving race programme, it still needs to be safe for every horse, regardless of its ability." 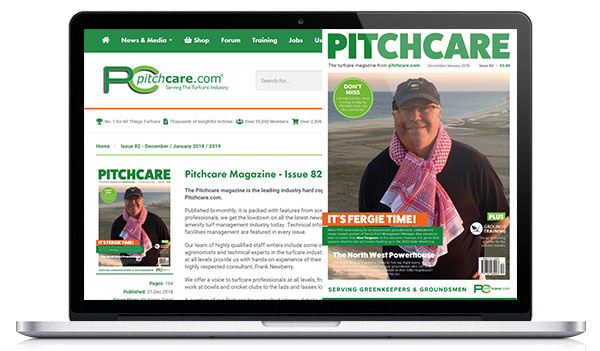 "Contrary to popular belief, all-weather surfaces need as much maintenance as turf to provide the consistent and safe going that we insist on. The surface is regularly worked to depth, levels regraded to take account of the track's camber and the material mixed and then firmed," Fergus explains. A range of techniques are used depending on the weather conditions. "The binder is more active in cold weather, so in winter the surface is worked down with Kongskilde spring tine harrows and then the Gallopmaster harrows are used to tighten it up," explains Fergus. "In summer, we try to work the track a week in advance to give the pad time to re-establish and then use the Gallopmaster to firm the surface on the raceday. Temperatures also affect how frequently we reinstate during racing - in winter, it will be once between races and, in summer, twice or three times." If rain is due to be followed by a frost, the Kongskilde harrows are used to open up the surface and get the water through. "The surface itself should not freeze, but any moisture in it will, so by opening it up we allow the water repellent binder to do its stuff and avoid a frozen track." Snow conditions are challenging. A light dusting of snow is insufficient to blade off, so will be worked into the material. Not ideal if a prolonged cold spell is forecast! 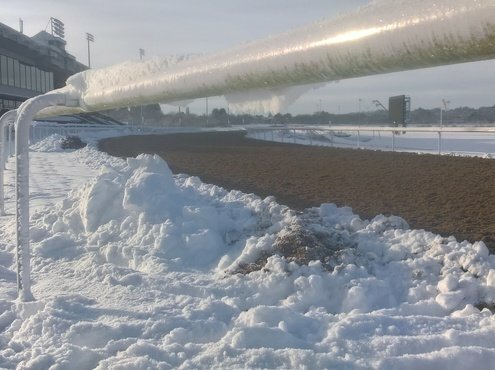 Deeper snow is pushed to the outside of the track where it remains until it melts, although the racing line and starts are cleared. "If temperatures are above freezing, it will thaw quickly in the surface, otherwise we have to keep mixing! Keeping the service road clear of ice is another important task - support vehicles follow each race, travelling in convoy at speeds up to 35mph." Fog can be unpredictable, and quick decisions have to be made to ensure that the support vehicles - vet, doctor, ambulance and estates team - can see the runners at all times. In the event of an incident, it is essential that the whole team can see what is going on. Likewise, if they need to attend a situation, if loose horses are on the track, it increases the risks to all involved. High winds can also become an issue if there is a risk of debris blowing onto the course. "We have to plan ahead, and weather forecasting is crucial. I use three different suppliers and take an average between them. 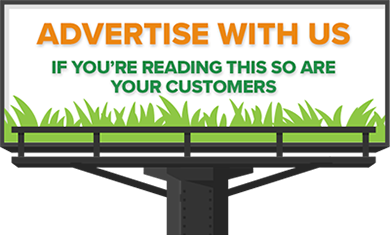 Our main advantage is that, because the surface is synthetic, it can be addressed using mechanical means rather than having to wait for grass to grow." Whilst the material doesn't get carried off the track to any great extent, the camber means that that it migrates towards the centre and has to be pulled out and the surface regraded, a process that takes two days for the full circuit. "We use a lute for this, but top of my shopping list would be a grader to do a better job!" says Estates Manager Paul Gosling. A rotavator and power harrow are used periodically to bring fines up from the bottom of the Tapeta layer and mix them back in again. Tractor power is an essential element, and Wolverhampton has two 2004 John Deere 110hp 6520s and a 150hp 6920 at its disposal. "We run the two Gallopmasters and rippers together so it's essential to have two tractors on hand at all times and they are kept well-maintained by the local dealer. They don't have a lot of hours on them, but are required to work in sub-zero temperatures when other racecourse tractors are in the shed, so reliability is key." Trainers from across the UK and Ireland send horses to Wolverhampton, and Fergus suggests that they base that decision on which horses handle the Tapeta surface and tight bends of the mile round circuit best. "We were concerned that there might be some overlap with Newcastle when all-weather racing began there, but have not noticed any difference in entries." Horses aiming at a turf campaign may also run at Wolverhampton, especially for races such as mid-March's Lincoln Handicap Trial. Fergus suggests that a perception that all-weather racing is for lower class horses is being overcome with the introduction of the All-Weather Championships finals at Lingfield on Good Friday with qualifiers across the tracks through the winter, plus increased prize funds. "We have a £100,000 prize money day, plus a couple of other £45,000 races, and have seen the quality of horses improve, whilst the top trainers are increasingly looking at the all-weather." 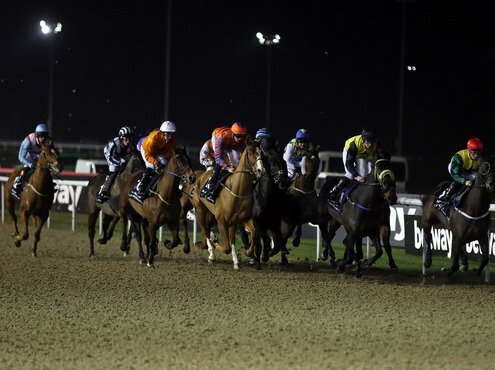 Whilst much of the betting action takes place off course, Saturday night racing is popular with spectators, and an initiative to offer free admission in January has also been well received. "One other advantage for punters is that the consistency of the surface means that form guides are more accurate, so picking a winner should be easier!" The Holiday Inn dominates the public entrance to the course, providing hospitality facilities as well as accommodation, and was refurbished in 2016. "We continue to review the public facilities which are very much part of the raceday experience," comments Fergus. "Wolverhampton was the first UK racecourse to have a panoramic restaurant, and it remains highly popular." 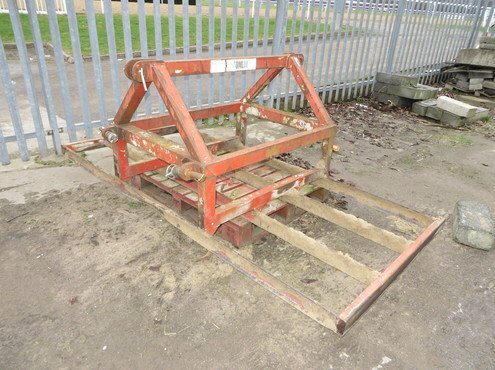 There is plenty for the grounds team to do away from the racing surface, such as weed control along the running rail and numerous grassed areas to maintain, so ride-on mowers a rough cut mower and flail are part of the armoury. "We play host to a number of non-BHA events, including pony racing, Arab racing and harness racing," explains Fergus, "The grassed centre course area is also popular for equestrian events from dressage to mounted games and we are also looking at a cross country event this year." The team of seven ground staff are also responsible for the stables, which have to be cleaned out after each meeting, even when racing three times a week. "The weather is certainly our biggest challenge," agrees Paul Gosling, "But I believe that we are working with the leading all-weather surface in the industry, and the best thing about my job is the great team that we have." 'Pile-ups' and horse falls always make for dramatic headlines in the racing press and can lead to criticism of all-weather racing, and Wolverhampton has faced this a number of times over the years. Fergus comments: "We race more frequently than most tracks, so there are more incidents. Trainers and jockeys know that it is not without its risks and, after any incident, the stewards hold an inquiry to investigate the causes, whether it be an error in riding, an issue with the horse or something to do with the track. They do the same if a horse pulls up lame." "We need to be confident that we have done everything possible to meet the requirements of the racing authorities, including how we have prepared the racing surface."